Excitement is growing among local olive oil producers as the third quarter of the year is award season during which the top olive oils will be recognised and applauded. Three of the biggest olive oil competitions namely SA Olive Awards, Sol d’Oro and The ABSA Top 5 will take place in South Africa during the months of September and October, recognising the hard work and effort that our local producers put into creating premium olive oils. Unlike the Mediterranean regions in the northern hemisphere where olive harvesting takes place during the spring, in the southern hemisphere the harvesting occurs in autumn. The freshness of olive oil affects the taste and smell, olive oil is in its prime soonest after harvest, thereafter its taste begins to fade. For that reason competition dates differ between the northern and southern hemisphere. 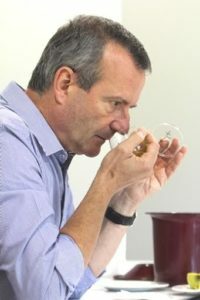 For the purpose of tasting olive oils, it is essential that they be sampled soon after harvesting occurs, making spring the olive competition season in South Africa. Every year the South African Olive Industry Association runs the SA Olive Awards. This competition recognises the quality of South African olive oils through the awarding of bronze, silver and gold medals according to the quality of the oils. All oils which carry the CTC seal are eligible to enter the competition. The oils (categorised into delicate, medium and fruity) are tasted blind by a panel of experts over several days according to quality, complexity and balance in terms of aroma and taste. The oils are scored according to international standards. The points awarded to each oil will determine its medal. SA Olive and Absa instituted the Top 5 competition in 2013 as an extension to the annual SA Olive Awards. The Absa Top 5 olive oils are selected from the ranks of the year’s SA Olive Awards top achievers by a revered panel of olive oil experts. The competition thus provides a platform for the South African olive oil industry to showcase its very finest. South African oils are regularly recognised around the world for their quality and distinctiveness, and competitions like the Absa Top 5 play a pivotal role in educating local consumers about the industry and its diverse spectrum of products. Sol d’Oro is the most important international olive oil competition in the world, organized by Veronafiere and traditionally held in Verona Italy. In 2014 Veronafiere organized the first edition of Sol d’Oro Southern Hemisphere dedicated to extra virgin olive oils produced in countries south of the Equator. Each year the competition will rotate throughout these countries and this year Cape Town, South Africa will have the honor of hosting the Southern edition of this world renowned competition. The competition aims to promote the world’s best extra virgin olive oils and encourage improvements in production and quality. Entries are open for the two categories in the competition: organic olive oil and extra virgin, the latter divided into delicate fruity, medium fruity and intense fruity categories. For more information and registration visit the SOL & AGRIFOOD site.